Contact dermatitis is a type of eczema triggered by contact with a particular substance. Eczema is the name for a group of conditions that cause skin to become dry and irritated. Contact dermatitis usually improves or clears up completely if the substance causing the problem is identified and avoided. Treatments are also available to help ease the symptoms. 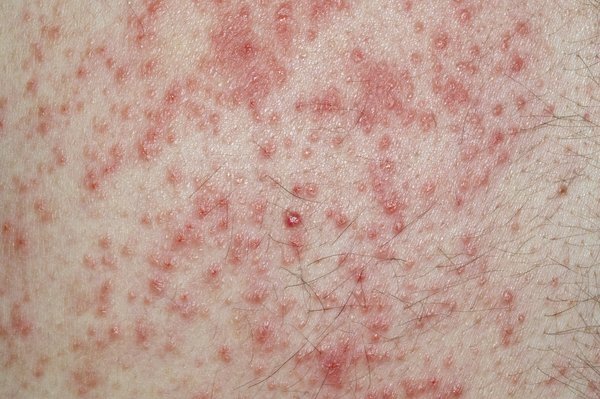 Contact dermatitis causes the skin to become red, blistered, dry and cracked. This reaction usually occurs within a few hours or days of exposure to an irritant or allergen. Symptoms can affect any part of the body but most commonly the hands and face. Read about symptoms of contact dermatitis. Speak to your pharmacist if your contact dermatitis is troubling you. They can recommend treatments such as emollients (moisturisers), which you rub on your skin to stop it becoming dry. See your GP if you have persistent, recurrent or severe symptoms of contact dermatitis. They can try to identify the cause and suggest appropriate treatments. Read about diagnosing contact dermatitis. Contact dermatitis is most commonly caused by irritants such as soaps and detergents, solvents or regular contact with water. Read about causes of contact dermatitis. If you can successfully avoid the irritants or allergens that trigger your symptoms, your skin will eventually clear up. Read about treating contact dermatitis. The best way to prevent contact dermatitis is to avoid contact with the allergens or irritants that cause your symptoms.